Our Road Trip Checklist « Midlife Crisis Crossover! Every year since 1999 Anne and I have taken a road trip to a different part of the United States and seen attractions, wonders, and events we didn’t have back home in Indianapolis. From 1999 to 2003 we did so as best friends; from 2004 to the present, as husband and wife. My son tagged along from 2003 until 2013 when he ventured off to college. 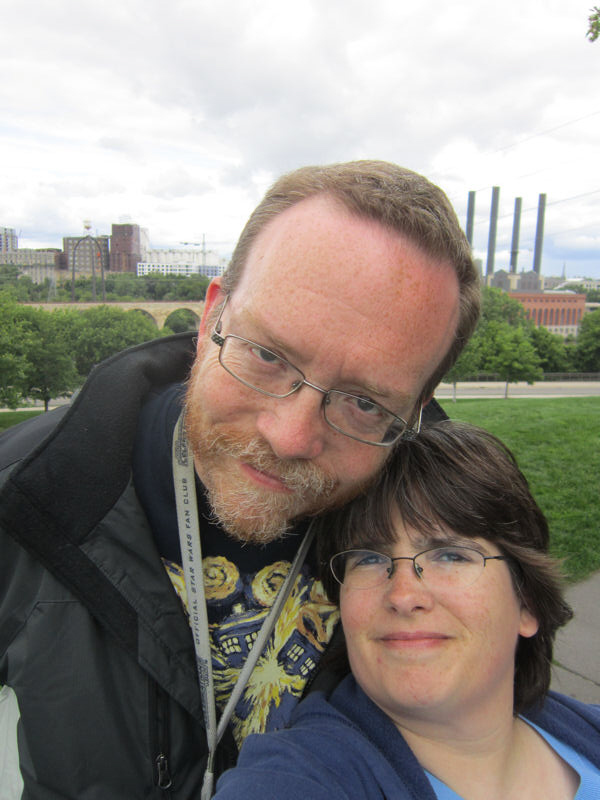 In our first four years as travel buddies, our trips took us to geek gatherings, three large and one personal. Since 2003 we’ve been heading in all directions on all the interstates we could reach, never on planes and only once beyond national borders. If we ever start yearning to push into new frontiers, we’ll see where our whims take us. So far America’s proven a multitudinous landscape that hasn’t yet run out of ways to wow, amuse, entertain, educate, impress, or humble us. The following is a complete list of every annual road trip we’ve taken together from 1999 to the present. Travelogs were posted on my old message board home through 2011. I launched Midlife Crisis Crossover as a grandstand of my own on April 28, 2012, and have posted them here ever since. My long-term plan is to rework those old write-ups and represent them here for a new audience when time and inclination allow. This process will involve rescanning old 35mm photos with better technology than what I used to have and hate, scanning photos that were never included the first time around, and revisiting whatever digital files we can recover in the wake of the heartbreak that was the Great 2015 Hard Drive Crash. Road trips that have been posted or reposted on MCC are broken down below by their individual chapters. Space has been reserved for future special-edition encores of the other road trips still waiting their turn. All of this is being provided to You, the Viewers at Home, as a courtesy for latecomers to the party, for longtime readers who missed episodes or love reruns, for old friends who remember our trips from back in the day, and for myself as online scrapbooks. Someday after my memory collapses, I’ll have no choice but to reread these pages and experience the joy and stress of every road trip all over again. Sure, a lot of couples prefer to spend their downtime at the nearest beach, book passage on a cruise, or max out their credit cards on a Paris dream trip. We have our own agenda. Finding creative ways to spend quality time together. Searching for tourism options that wouldn’t occur to our peers. Digging for gems in unusual places — sometimes geek-related, sometimes peculiar, sometimes normal yet above average. We started small, with a simple overnight trip to our very first Wizard World Chicago. Today it’s become an annual ritual for us. At the time it was an astronomical challenge to our budgets and navigational skills. The complete epic was recounted online for the first time in January 2017, including many photos never before shared online. We met cast members from Mystery Science Theater 3000, attended a Q&A with author Terry Pratchett, and, in the first of many live meet-ups with internet folks, had dinner with a couple dozen loveable MSTies I knew from Usenet. We lived to tell and appreciate the tale, relived here in January 2017 in vintage 35mm-o-Rama. We made the 300-mile drive to Superman’s hometown four times between 2001 and 2012. We’d love to go again someday, more than once if the stars keep aligning, but every year the second weekend in June invariably has issues for us. I don’t remember ever sharing more than one or two of the photos from 2001 with online friends at the time, but everything we have was uploaded to MCC in June 2015 with all-new narration. We visited internet friends in honor of the release of Star Wars: Attack of the Clones. We saw it twice on opening day, celebrated my 30th birthday, and found a few other things to do around town. Our memories are fading and our photos are incomplete, but we pieced together just enough for a revisit in February 2017. We married on July 17th of that year, took a honeymoon weekend up by Lake Michigan, and the following weekend drove out to the Falls with my son in tow. We saw both Lakes Erie and Ontario, saw a smidgen of Buffalo, and took a one-day detour into Canada, in those halcyon days before passports were required. On the way home we spent several unplanned hours in Ohio due to a comedy of terrors. To this day we hold a mighty grudge against the big fat Buckeye State and refuse to let it go. The remastered version of this tale was first published on MCC in March 2017. Even in our first comfy rental car, driving from Indianapolis to the deep heart of Texas was grueling and dehydrating and frequently miserable and I can’t believe we ever thought seven days would be enough. While in the areas we stepped into Arkansas and Oklahoma for our first and only times to date, and — in an extremely rare feat for us — visited relatives on the way. The remastered version of this tale was first published on MCC in April-May 2017. 2006 was the year I upgraded from my old Kodak EasyShare to a Canon, while my wife held tightly onto her modest 35mm camera for a bit longer. In mid-2014, the year we staged a sequel, I revised large portions of this series with a George Lucas Special Edition Editing Hammer and represented it here for MCC followers, along with many photos that we’d never shared publicly before. Back in 2006 I hated our scanner and never cared for the available photo-editing software. With the help of slightly newer technology, I’ve now compensated for my past lazy reluctance. Photos #12: Spam! Spam! Spam! Spam! Our primary target was Universal Studios, but we found plenty of stops along the way in Tennessee, Georgia, and other parts of Florida’s upper half. This year wasn’t just six dozen shots of my son enjoying some supercharged carnival rides. The remastered version of this tale, featuring dozens of previously unshared photos, was first published on MCC in May-June 2017. The worst vacation we’ve ever taken for a variety of reasons. Some of those reasons were medical. We thought our biggest regret would be the one-night stay in West Virginia, but no, that was the least of the drawbacks. The remastered version of this tale, featuring dozens of previously unshared photos, was republished on MCC in January-February 2018 at nearly double the original length. Part 6: By Neptune’s Trident! This travelogue was the last to be remastered from its original internet pubclication because it’s one of our all-time favorites. So. Many. LANDSCAPES. Also featuring stopovers in Chicago, Omaha, and Iowa. The MCC version was worked through May-July 2018. My wife the history buff demands a do-over on this one someday. Anne’s original concept had been a direct drive to Philadelphia for a miles-deep dive into endless fascinating American history. However, the long distance between here and there gave us so many other attractions to see along the way that we ran out of time for Philly itself and barely scratched the surface of this original colony. We did a lot, mind you, but the unchecked items on our to-do list were quite a shame. On the other hand, one of the detours took us to Liberty Island, which was such an awe-inspiring experience that we knew our next vacation would have to be a sequel. The MCC revamping of our Philadelphia story was posted in March-April 2018. Midlife Crisis Crossover calls Manhattan “Best Vacation Ever!” I want to redo New York City over and over again until I die. I’d drop by annually if my wife would let me, but a lot of other states are still waiting for their turns with us. We also found a couple of places in New Jersey that don’t deserve to share the brunt of two hundred years’ worth of New Jersey punchlines. We enjoyed ourselves so much that we arranged a sequel vacation in July 2016. For the occasion I reprinted and overhauled this series for MCC followers from its original online publication, adding thousands of new words and many, many photos never shared publicly till now. Our first full engagement with the magnificent Rocky Mountains was our first road trip to be written up exclusively for MCC after it launched on April 28, 2012. The diversions in Kansas weren’t 100% boring, either. I submitted one live text-only update every evening to my precious few followers from our hotel while we were on the go, then shared the photos in installments over the subsequent months. Two cities older than our hometown. One filled with history, the other with pop culture. Sounds like a travel agent booked it specially for her and me, really. Featuring special guest stars Pennsylvania and upstate New York, plus a cameo by Connecticut’s bad side. MCC followers were treated to one preview photo per day while we were on location. For our tenth wedding anniversary, our first vacation alone together since 2002, Anne allowed me the privilege of choosing a direction. I settled for a sequel to our 2006 trip because I loved the upscale-Midwest ambiance and I thought we gave the Twin Cities short shrift. For a little variety we tacked on a digression into southeastern North Dakota. This one began as a simple idea: visit ostensibly scenic New Orleans — home to jazz, voodoo, Cajun and Creole cuisine, fresh seafood, beignets, Mardi Gras, alcoholic revelry, Emeril, Harry Connick Jr., HBO’s Treme, NCIS New Orleans, Swamp Thing, The Princess and the Frog, great moments in American history, and horrifying moments in severe storm damage. We’d never been to Louisiana itself, let alone the world-famous Crescent City, but there was something about the idea of seeing New Orleans ten years after Hurricane Katrina that stuck with me and wouldn’t let go. We researched numerous possible routes, cities, and towns to visit along the way in Kentucky, Tennessee, Alabama, and Mississippi. This would prove to be our deepest journey into the heart of the South. #33: Do You Know What It Means to Miss New Orleans? From November 1-6, 2015, we racked up a number of personal firsts. My wife Anne was invited on her first business trip to Colorado Springs, all expenses paid from flight to food to lodging to rental car, to assist with cross-training at a distant affiliate. Her supervisor gave me permission to attend as her personal travel companion as long as I bought my own plane ticket and food. Neither of us had ever flown before, largely because we each grew up in families too poor for such extravagance. We’ve also never taken two week-long vacations in a single year. Thanks to our unforeseen circumstances, we were shocked to find such things no longer inconceivable. Strictly speaking, this wasn’t a road trip per se (except for the wide detour we took on Day One), but by our standards it’s a sufficiently major event for us to merit inclusion alongside our other vacations. Emboldened by our first successful foray into air travel with the previous November 2015’s partly funded trip to Colorado Springs, we decided to give my son his own first chance to fly the friendly skies by planning our long-awaited sequel vacation to Manhattan. This time we avoided all other states, dipped our toes into at least one other borough besides Manhattan, and tried a few NYC-specific experiences that eluded us the first time. Photos #9: It’s Chinatown! Again! Yes, AGAIN. Photos #26: Do You Remember Rock & Roll Radio? Our return to annual road-tripping took us to the home of The Wire, Homicide: Life on the Street, and multiple movies by John Waters, Barry Levinson, and a host of other filmmakers proud to be from the oft-maligned city. A combination of colonial history and overt tourist attractions kept us busy for three days, while the roads there and back again allowed for stops at two Civil War battlefields, numerous panoramas, one of the best hotels ever, and at one point a lot of elephants. Instead of focusing on attractions in one area, we plotted a course using one of the motifs that’s recurred through several of our trips: grave sites of Presidents of the United States of America. This trip effectively had the format and feel of a video game side quest — collecting nine American Presidents across ten presidencies, four states, seven days, and 2000 miles.